A twin pregnancy means double the reason to celebrate. But you’re also in for some serious weight gain with twins. Don’t worry, though. While you may put on significantly more weight than you would with a singleton pregnancy, it’s all perfectly normal and actually quite necessary as you’re carrying two babies. All that twin pregnancy weight will be worth it. Though all the extra weight can make it seem impossible to get back to your normal size after all this, just concentrate on your pregnancy and on gaining the right amount of weight for now. If you’re really intent on getting back to your pre-pregnancy size after the births, watch what you eat during these next few months. Being mindful of your diet will also help you avoid weight-related pregnancy issues like gestational diabetes and preeclampsia. So how many pounds will you gain during a twin pregnancy? Let’s break it down. Doctors suggest keeping twin pregnancy weight gain to between 37 to 54 pounds. That’s roughly double the weight gain recommended for singleton pregnancies. However, if you were already a bit overweight before your pregnancy, you should aim to gain a little less than that. If you were underweight before you got pregnant, aim to gain a little more. If you were obese pre-pregnancy, with a BMI of 30 or more, keep your pregnancy weight gain between 25 and 42 pounds. If all that extra weight seems extreme to you, don’t worry. It’s not all fat that will sit around long after you’ve birthed your babies. The twins themselves will account for between 10 to 12 pounds of the total weight gain. During your pregnancy, you will be producing extra blood and a lot of amniotic fluid. These liquids help your babies grow in the womb. You’ll also be retaining a fair amount of water weight. Once your water breaks and your babies are in your arms, this extra weight will be gone. 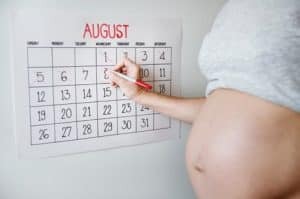 You will drop about 30 pounds in the first couple of weeks after birth, which means you’ll be in about the same place as someone who gave birth to just one baby. A twin pregnancy can feel like it lasts much longer than a singleton pregnancy. Given that you’re advised to gain about 37 pounds, does this mean you should be putting on a pound a week during your pregnancy? Well, it’s not always that simple. There will be weeks when you’ll put on a couple of pounds and weeks when you’ll remain the same weight. There will also be weeks when you suddenly gain a lot of weight. Here’s a rough guide on what to expect in terms of weight gain during each trimester in a twin pregnancy. First trimester — This is when you’ll be experiencing a lot of morning sickness. Your main challenge will be trying to keep food and liquids down. Instead of worrying about not putting on enough weight, focus on controlling your nausea. Some moms find relief in eating small carbohydrate-rich meals. Ideally, you should be gaining about a pound a week in the first trimester, but if the queasiness isn’t letting you eat much, don’t worry. You can catch up when you start to feel better. Make sure you stay hydrated and don’t forget to take your prenatal vitamins. Second trimester — For most moms, the worst of the morning sickness will have ended by this point. Now you can make up for the weight you didn’t gain in the last three months. Aim to put on between one and a half to two pounds a week by adding a lot of protein- and calcium-rich foods to your diet. Incorporate lots of beef, chicken, turkey, pasteurized cheese and milk, legumes, and whole grains into your diet during this trimester. Third trimester — If you’ve been successfully putting on between one and a half to two pounds per week, just continue on this path. By this point, your babies will have significantly grown such that you may be experiencing indigestion and heartburn every time you eat. Don’t let that stop you, though, because your twins need all the nutrition they can get in this final stretch. By the eighth month, the weight gain will have slowed down to a pound a week and just a pound a month in the final month. Not all pregnancies are the same, so try not to compare your pregnancy weight gain with that of other moms. 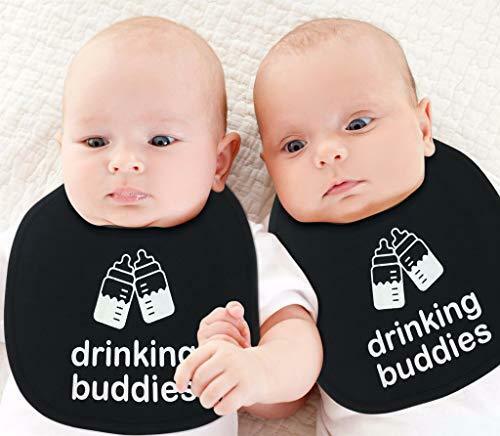 The important thing is to be mindful of your and your twins’ health. Don’t be too concerned about losing the pregnancy weight just yet. Remember that insufficient weight gain during a twin pregnancy boosts the risk of preterm birth. Consult your doctor about your weight gain and keep track of your weight throughout your pregnancy. 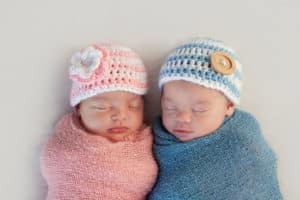 Do you have any tips for controlling weight gain with twins? Share your experience in the comments below.